What image does the phrase ‘Africa’s youth employment challenge’ bring to mind? Is it, for example, an image of social unrest and violence; or of young migrants risking everything to get to Europe? Or an image of family and personal sacrifice to gain coveted educational qualifications? Or perhaps an image of young people doing small-scale farming with little more than a hoe and cutlass? Actually there is much to suggest that the image that many policy makers and development actors most closely associate with ‘Africa’s youth employment challenge’ is that of a successful youth entrepreneur. Featured and celebrated at international conferences, profiled and awarded in magazines and online, and looked to for insight and inspiration, the African youth entrepreneur has come to embody the conviction that real, home-grown and sustainable solutions to the employment challenge are indeed at hand. It is certainly true that the young entrepreneurs on the international conference and consultation circuit are a very impressive lot. They are enthusiastic and inspiring, and talk of their journeys with simplicity and charm. The effect is both captivating and disarming. But sitting through a session of presentations by these young entrepreneurs leaves a sense of unease that is difficult to pin down. Is it that they all seem to come from relatively privileged backgrounds, or if not, have benefited from scholarships, high quality training or mentoring programmes? Predominately urban and university educated, it is certainly the case that the new celebrity youth entrepreneurs are a universe away from the vast majority of African youth. The diagram* below shows the relative distribution of Africans aged 15-24 across four categories: ‘Urban, good education’; ‘Urban, poor education’; ‘Rural, good education’; and ‘Rural, poor education’. For our purposes here, completion of upper secondary school is used to distinguish good from poor education. 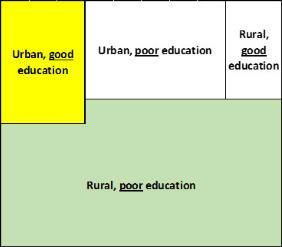 The diagram shows the ratio of individuals in each category relative to those in the category ‘Urban, good education’. Overall, ‘Urban, good education’ accounts for only 15% of the total, while for each individual in this category there are 3.7 others in the category ‘Rural, poor education’ (accounting for 56% of the total). Here is the question: if it is true that the celebrity youth entrepreneurs are drawn predominately from the category ‘Urban, good education’, and their experience represents, at best, only a small minority of even this (minority) category, then why are their experiences and perspectives given so much weight? 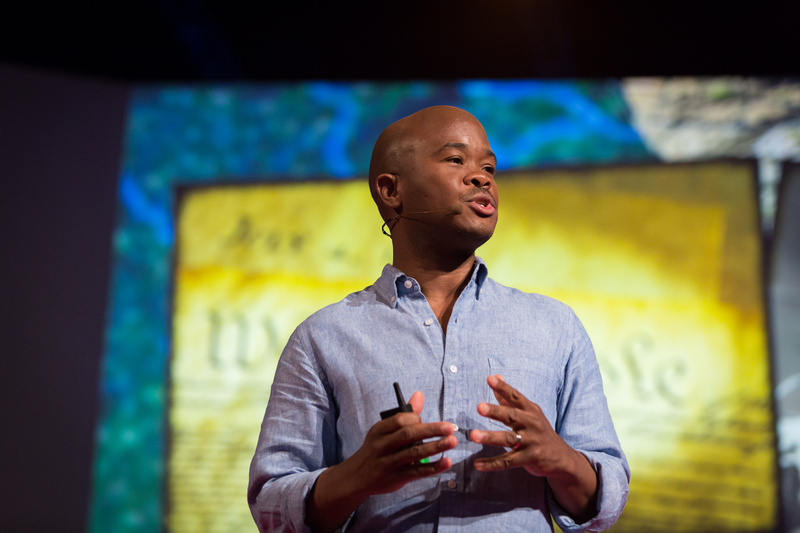 They certainly don’t represent African youth – either in the sense of being representative or typical, or in the sense of having been given a mandate. Yet, that is exactly how they are often presented, as the genuine ‘voice of African youth’. As shown in the diagram, a poorly educated young person living in a rural area would be much more representative (but perhaps a much less compelling presenter). There might be good reasons for targeting, investing in and promoting relatively well-educated African youth entrepreneurs. They might, for example, be expected to play a part in job creation. However, to do this in a way that fosters what is beginning to look like a ‘cult of the African youth entrepreneur’ is misguided. The core of the youth employment challenge, and the voices of those most affected by it, are elsewhere, and it is absolutely critical that this is both recognised and acted upon. ‘Good education’ defined as: upper secondary completion among population aged 3-5 years above graduation age; everyone without a ‘good’ education is considered to have a ‘poor’ education.